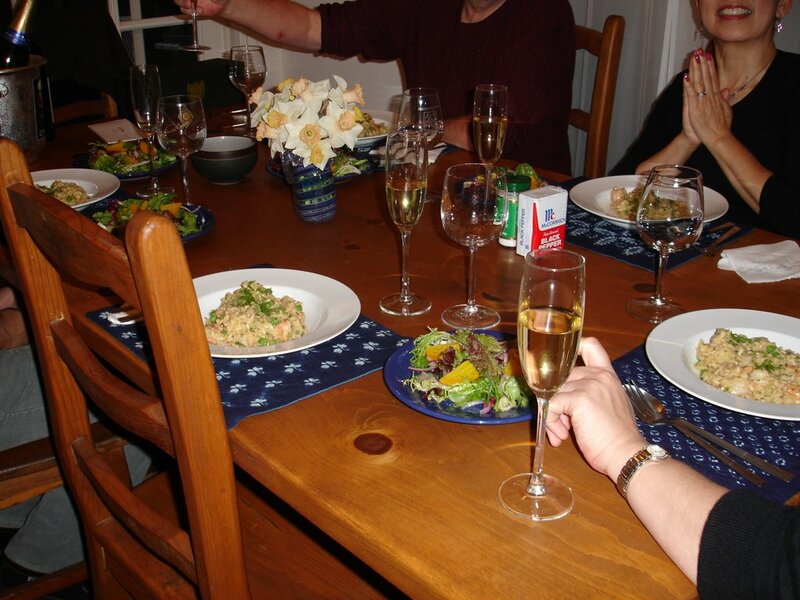 Last Saturday night, I had my family over for Easter Eve dinner. 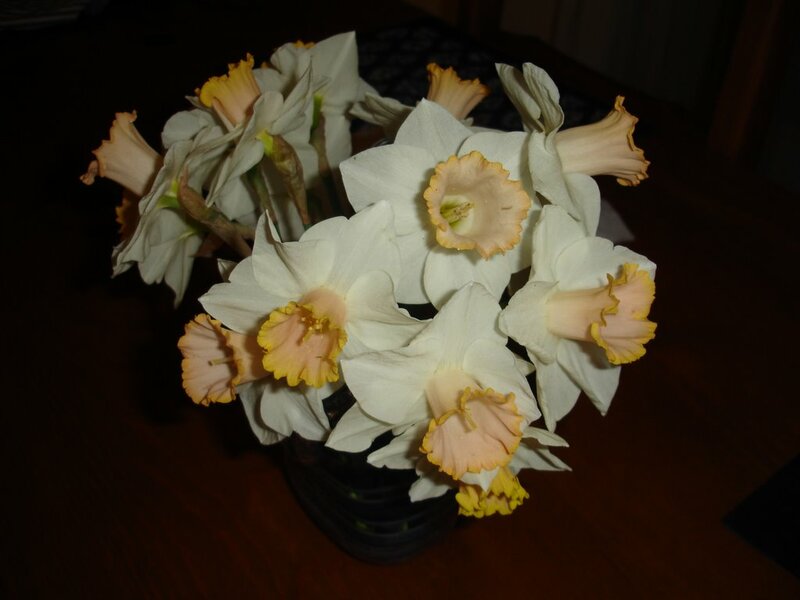 You didn't know there was an Easter Eve, did you? It's the one that is always held on a Saturday so that everyone can drink to their heart's desire and still have one more weekend day to recover....I mean relax. It's no fun getting all festive the day before everyone has to go to work early. Initially, I thought I'd make a nice lamb roast, but then realized that my parents were bringing over the foie gras that J and I got them from France last summer. I didn't think a big hunk of meat would be the best thing to consume right after eating copious amounts of duck liver potted in duck fat (YUM). I needed to make something a bit less....um, meaty. Since almost every recipe I've made out of Alfred Portale's Simple Pleasures, Home Cooking from the Gotham Bar and Grill's Acclaimed Chef has been a winner, I once again consulted my trusty copy. 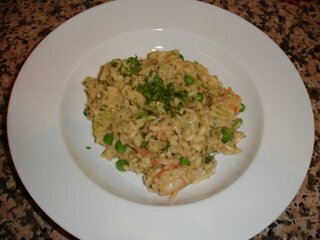 I decided on the Shrimp Risotto with Sweet Peas, Leeks, and Chervil since it fit well into Spring. 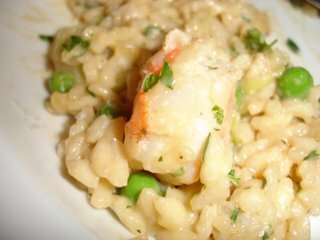 The risotto was so easy to put together- I managed to get a good 15 minutes of foie time with my family before even starting the main dish which took about 30 minutes total. In addition to the duck liver we had some beautifully gooey Roquefort filled with crystals and a nice, mellow goat cheese to go with the dried onion crackers. I did prepare my mise en place earlier in the day which freed me up to socialize. The foie gras was rich and delicious and went so well with the '98 Dom Perignon that we finally opened since receiving it on my birthday (thanks Debra!) two months ago. It was my first Dom and I have to say it was excellent! Beet salads ready for pick up! 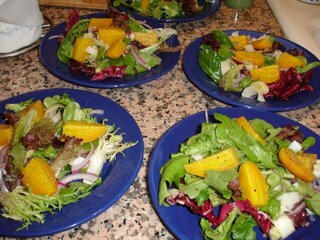 We had the risotto with a green salad with roasted golden beets (again....I know I just blogged about them but are so good I could eat them daily). Although the risotto recipe doesn't call for any grated cheese, I had grated some pecorino romano and set it on the table, which ended up being a good idea. Although the texture of the risotto was perfect, it was missing that little extra punch. Adding the cheese really tied everything together. I also think that by using a very large Dutch oven, I had too much surface space so the rice absorbed the stock very quickly. 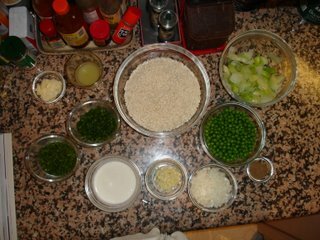 This resulted in the risotto being done (texture-wise) after using only half of the stock which probably contributed to the slight lack in flavor. Next time I will use a smaller pot. Other than that, I loved the combination of plump shrimp, tender leeks and sweet green peas and will definitely make this again. 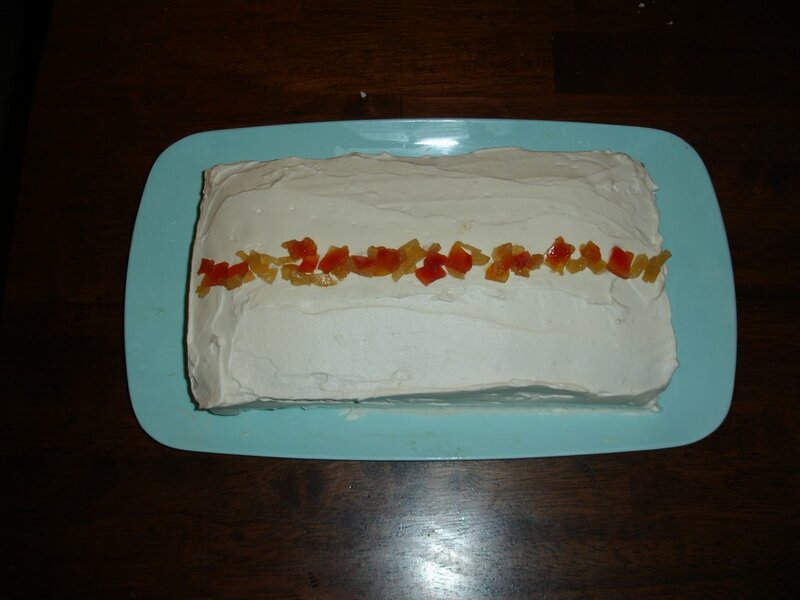 My sister made a fantastic tropical cake for dessert- I can't remember the exact name but it is an Elizabeth Falkner (of Citizen Cake fame) recipe. The cake was very limey and was topped with freshly whipped cream and dried fruit. We ate it while watching our family favorite, Dotchi No Ryori Show. Wow- I should be a guest on that show since I mention it so much on this blog! I don't work for them I promise. I wish I did though......so if any of the producers are reading this.....;). Actually, we did do a cooking segment on the show that I DO work on...more on that tomorrow! Anyway, hope everyone had a wonderful holiday weekend.